This week we’ll be looking at Hydreigon. Introduced in generation five, Hydreigon has been an interesting Dragon type the sets itself apart from the previous Dragon types. It was the first of the pseudo legendary Dragons to favour special attack over physical attack and also has a unique type combination. Hydreigon has never been the most popular Dragon in VGC due to competition from the stronger and faster Latios in 2012 and 2013 and Scarf Salamence in 2014. Despite this Hydreigon has seen it’s fair share of success over the years. I’ve changed up the formatting a bit this week, instead of listing all the moves for a Pokemon I’ll first list the sets and then have a section for the other options. Hydreigon has fantastic base stats, yet I can’t help feeling like Game Freak went out of their way to troll Hydreigon. Giving it a base speed just below all the base 100s in the game is a major pain for Hydreigon. This low speed stat really holds Hydreigon back against Garchomp, Kangaskhan, and non-Scarf Salamence. Hydreigon’s speed stat is what I attribute its lower usage to, its easy to be a hipster and say I’m going to promote the lesser used Dragon but it sees less usage for a reason. Speed aside Hydreigon has been blessed with base 125 special attack, giving it the strongest Draco Meteor outside of legendary Pokemon (and only being 5 points behind Latios). 92 HP and 90 in each defence makes Hydreigon fairly bulky. Dark / Dragon is what sets Hydreigon apart from Salamence. Hydreigon resists Electric meaning it resists all of Rotom’s STAB moves (unless you encounter these rogue Rotom-F and Rotom-A). Dark also gives you resistances to Dark and Ghost as well as an immunity to Psychic. The downside to this typing is that you’re weak to Fighting and Bug. Instead of being 4x weak to Ice Hydreigon is 4x weak to Fairy. This is actually a pretty good trade off as Hydreigon can survive an Ice Beam unlike Salamence and while it gets KO’d by any Fairy move Salamence wasn’t surviving a Fairy move outside of a Dazzling Gleam. Hydreigon’s only Ability is Levitate. This grants Hydreigon an immunity to Ground type attacks. Having a free immunity is nice, and it lets Hydreigon’s partner use Earthquake with worry. Choice Specs Hydreigon is one of the strongest special attackers we have in the format (considering most Pokemon with higher Special attack are either a Mega and don’t get to use Choice Specs or don’t have a reliable move with Draco Meteor’s base power). This Hydreigon can smash right through most of the metagame, OHKOing 4 HP / 4 SDef Mega Kangaskhan. Dark Pulse and Dragon Pulse are your reliable STAB moves for when you need to lock into one moves for the rest of the battle. Fire Blast is for Steel types and gets a clean OHKO on Ray’s Mega Mawile. This spread reaches 140 speed which puts it ahead of neutral nature Rotom and positive nature Smeargle. It’s also considerably faster then DarkAssassin’s Hydreigon so it’ll beat anyone copying his set as well as anyone trying to speed creep that Hydreigon. Ideally I’d be able to invest a bit more into speed as 140 is a good number to settle for but I needed all the remaining EVs for bulk. 20 HP / 60 Def survives Jolly Garchomp’s Dragon Claw and Adamant Mega Kangaskhan’s Return. Being able to take a hit from either of these Pokemon is a major boon to a Pokemon that can’t out speed them. 4 HP / 76 Def survives these attacks all the same, but 4 HP / 68 doesn’t so theres no room to increase speed. Scarf Hydreigon is kinda like Scarf Salamence, except you always lose the speed tie, you don’t have Intimidate and you hit harder. You could use a Timid nature to beat Modest Scarf Salamence but since you won’t even have Intimidate to give you and indication of which Dragon is faster and you’ll always lose to Timid Salamence I wouldn’t bother trying. The EV spread is exactly the same as before. I didn’t intend for this to happen but I actually came up with the same one without realizing it. At least you won’t have to worry about retraining a Hydreigon if you switch items. 252 Special Attack is obviously for maximum damage output. 172 Speed puts Hydreigon at 210 speed after the Scarf is applied. This puts you ahead of Mega Manectric and Scarf Smeargle. The remaining was put into HP until I realized I had the same amount of investment left for bulk and could survive the hits the previous set could (although surviving them is less important now that you out speed them). If you don’t want to use Choice items there’s always a Life Orb set. Since we’re using Life Orb there isn’t much point investing in bulk as you’ll finish yourself off with Life Orb recoil. Flamethrower is an option if you don’t like the 85% accuracy of Fire Blast, but you’ll miss out on KOs against things like Mega Mawile depending on your set. Hydreigon still learns Earth Power but there isn’t much point to it without Heatran in the format. Sleep Talk is an option on choice sets to help against Dark Void and Spore. U-Turn can be used on a Choice Scarf set to scout switches. Hydreigon gets a couple support moves like Thunder Wave, Taunt and Roost, I wouldn’t recommend any of them but if you want to play Hydreigon that way go for it. Hydreigon can be made to survive Draco Meteor’s by way of Assault Vest or Haban Berry so that it can respond with its own Dragon move. This can catch opposing Salamence and Hydreigon by surprise. Some form of speed control is greatly appreciated by Hydreigon. Unfortunately we don’t have a lot of options for this in the format. Thunder Wave support is probably the best way to use speed control right now. Hydreigon will enjoy seeing a Salamence or Kangaskhan paralyzed. Gyarados, Miltank, Rotom and Zapdos are all bulky Pokemon that spread paralysis with Thunder Wave. Follow Me / Rage Powder support is greatly appreciated. Amoonguss is probably the best partner for Hydreigon, being able to tank a Draco Meteor or Fighting move aimed at Hydreigon and using Regenerator to heal itself. Fairy types will KO Hydreigon with ease. Azumarill can take anything standard Hydreigon can throw it’s way and OHKO in with Play Rough. Gardevoir and Mawile can also OHKO it with their Fairy moves, but both of them need to be wary of at least one of Hydreigon’s moves. Wigglytuff resists Hydreigon’s STAB moves and can KO with Dazzling Gleam. Outside of Fairy types countering Hydreigon depends on what set its running. A non-Scarf set can be out sped by a number of Pokemon and OHKO’d with their STAB moves. Mega Lucario, Salamence and Hammer Arm Mega Kangaskhan are all examples of this. Hydreigon isn’t as easy to slap on a team as Garchomp and Salamence, but its still a strong Pokemon and can tear through teams if given the proper support and played properly. I expect this Pokemon to see more play at Nationals but only time will tell if it can oust Salamence as the goto Draco Meteor user. This week I’ll be looking at one of my favourite Pokemon in the format which has been a staple on many of my teams. Rotom debuted in generation four, and gained five alternate forms in Platinum. Each form got its own signature move and in generation five each Rotom’s secondary type became the same as the signature moves type. Rotom-H began to gain popularity around the time of winter regionals when players realized they needed a strong Fire type and found the options to be scarce. Rotom-H has a mediocre base HP, with some great defences to go with it. Investing in HP and giving Rotom-H Sitrus Berry makes it hard to OHKO. 105 Special Attack is enough for Rotom to have some offensive pressure, especially with a high base power move like Overheat. 86 Speed puts Rotom firmly below the base 100+ range but has it sitting above most everything else. Electric / Fire typing is great with Levitate. Rotom-H resists Electric, Ice and Fire, all of which are types I find myself wanted more resistances too. Being a Fire type at all is a major boon to Rotom-H, as we have a severe lack of viable Fire types in VGC 2014. Rotom-H’s only ability is Levitate. This patches up Rotom’s would-be 4x weakness to Ground, which would make it nearly unplayable. Keep in mind that this ability won’t save you from Mold Breaker users like Mega Gyarados. This EV spread is the pinnacle of defensive Rotom-H spreads. I used this spread in Washington and I’ve never found a reason to change it. When I originally made it I only had a couple goals in mind but by shear coincidence it manages to just barely survive several strong attacks with the highest damage roll. If you want your Rotom-H to be bulky while still applying offensive pressure look no further then this spread. This Rotom-H focuses on getting OHKOs instead of surviving multiple hits. There are a handful of Pokemon Rotom-H can’t OHKO on its own and Life Orb gives it the boost it needs to always net the OHKO on them. This Rotom always OHKOs Amoonguss, Mega Manectric, Garchomp and Salamence with either Overheat or Hidden Power. This set out speeds positive natured base 70 Pokemon. The rest is put into HP to reach 139 HP, a good amount for reducing Life Orb damage. Scarfed Rotom will often take your opponent by surprise. This set out speeds Mega Manectric. Be aware that this set loses a ton of bulk by not investing in HP. I’m often disappointed by this set as it lacks the bulk of a standard Rotom and HP Ice lacks the power to OHKO Garchomp. Being able to Will-O-Wisp Kangaskhan before it attacks is nice though, as is being able to out speed Gyarados and avoid taking a Waterfall. Expert Belt can be subbed in Life Orb so Rotom-H can stay in play longer. This will cost you the OHKO on Mega Manectric and reduce your damage output in general. Safety Googles makes Rotom-H a hard counter to Charizard / Venusaur, but that lack of healing will hurt you outside of this combo. Leftovers is an alternate healing item if another teammate needs Sitrus Berry. Thunder Wave is an alternate status move that provides speed control over attack reduction. Discharge can work on a team with Lightning Rod / Telepathy / Ground Pokemon. Substitute is a cool move I’ve had successfully used against me, if neither of your opponent’s Pokemon can threaten Rotom-H you can put up a Substitute and make it harder to deal with. This also works great when facing Amoonguss and Mawile that want to bait an Overheat and switch into a Fire resist. What can’t be paired with Rotom? I’m not kidding Rotom-H and it’s other form Rotom-W slot onto pretty much any team you want them to. Due to the lack of Fire types in the format you have your choice of Charizard, Rotom-H, Talonflame, Pyroar or using Pokemon like Manectric, Hydreigon, Salamence and Tyranitar that have non-STAB fire attacks. Of these fire types Charizard takes your Mega slot, Talonflame has its issues and while Pyroar handles the offensive side well it doesn’t take hits at all. Rotom-H will want partners that can handle Rotom-W and other Water types. Amoonguss, Venusaur and Ludicolo. all fit the bill. These Pokemon benefit from Rotom-H hard countering Talonflame. Things like Mega Charizard and Specs Hydreigon that can simply muscle through Rotom-W’s defence are also welcome additions. While Rotom-H can burn a Kangaskhan it doesn’t beat it on its own so having Pokemon that help it out are nice to have. Rotom-W can take any attack from Rotom-H and OHKO with Hydro Pump. Most Water types that can out speed Rotom-H can check it with Hydro Pump, Ludicolo and Kingdra are good choice as they aren’t weak to Thunderbolt. Mega Charizard X doesn’t care about anything Rotom-H can do to it bar Thunder Wave. Rotom-H can’t do anything to Rotom-H either, but Rotom-H won’t be able to do anything to Rotom-H to take advantage of this unless you run HP Rock or something. Garchomp can handle Rotom-H if it lacks HP Ice. Rotom-H will have to land 2 Will-O-Wisp to burn a LumChomp while being hit by Rock Slide each turn. You’ve probably seen a thousand Rotom-H this season, and statistically you’ve used it at some point yourself. So clearly you already know this thing is great. I hope that you were able to take something new from this post and either use it or be aware of it yourself. Rotom-H isn’t going anywhere and just like the seasons you need to know how to beat the heat! Today I’ll be looking Gyarados. Gyarados was introduced in Generation 1, and while it’s one of the coolest Pokemon around it wasn’t very good until Generation 3 when it got Intimidate and Dragon Dance. In Generation 4 Gyarados really hit its stride with the physical/special split making Waterfall a physical attack. Gyarados hasn’t changed much since then, but it hasn’t needed to. 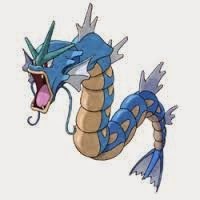 Generation 6 has given Gyarados a Mega Evolution, adding to the list of roles it can play. Gyarados has been a great Pokemon in VGC, bringing Intimidate support to teams, threatening with Dragon Dance, even running Choice Specs that one time. Despite all of its great traits Gyarados has always had to deal with its 4x weakness to Electric. Over the last three years Thundurus and/or Rotom have been very popular Pokemon and Gyarados will need to rely on its teammates to deal with these Electric types. Gyarados has a fantastic base 125 attack. 81 Speed is decent especially when Gyarados uses Dragon Dance. 95 / 79 / 100 defences are also pretty great when you factor in Intimidate. Water/Flying typing comes with an unfortunate 4x Electric weakness and an inconvenient Rock weakness but provides resistances to Fighting, Fire, Water, Steel, Bug and an immunity to Ground. In terms of stats Mega Gyarados just gets stronger and more resilient. What’s interesting is the change in typing. Water / Dark is worse overall compared to Water / Flying but Gyarados’ previous weaknesses are lessened and while it gains several problematic weaknesses it’s base form resisted them so before you Mega Evolve your opponent will be left to guess which moves will be effective. Gyarados’s main Ability is Intimidate, one of the greatest Abilities in VGC. Lowering both the opponent’s attack whenever Gyarados switches makes Kangaskhan more manageable and makes it easier for Gyarados to take repeated Rock Slides. Gyarados’s Hidden Ability is Moxie, which boosts it’s attack whenever it KO’s a Pokemon. While this isn’t a bad Ability it isn’t worth giving up Intimidate to use. Mega Gyarados’s Ability is Mold Breaker. This allows Gyarados to hit Rotom with Earthquake and ignore Mega Venusaur’s Thick Fat. Keep in mind that Mold Breaker will affect your Pokemon as well, so any partner with Levitate or Telepathy can still get hit by Earthquake. Waterfall and Aqua Tail are Gyarados’s choice of STAB moves, with Waterfall having perfect accuracy and a flinch chance and Aqua Tail having a chance to miss but more power to make up for it. Other attacks include Ice Fang, Earthquake and Stone Edge. Gyarados generally has room for two damaging attacks unless it’s a choice set so you’ll need to pick based on which type coverage you want on Gyarados. If you want a Dark move for Mega Gyarados your only options are Bite and Payback. Its a shame Gamefreak didn’t give Gyarados something like Crunch to go with it’s new Mega Evolution when they gave Blastoise Aura Sphere, Dark Pulse and Dragon Pulse to go with it’s Mega Evolution. For non-damaging attacks Gyarados has Dragon Dance, Taunt, Thunder Wave and Protect. I came up with this spread while trying to reverse engineer Tony’s EV spread from Washington Regionals. From the streamed games I could see that it had an HP stat of 192 so I used 172 EVs to reach it. Tony later told me that this is a good Leftovers number and conversely a bad Sandstorm number, and he meant to drop the HP by 1 before the tournament. The Speed EVs allow Gyarados to reach 192 speed after a Dragon Dance, putting it above Scarf Tyranitar with a positive nature. The rest were put into Attack. I stole this spread from Imouto Island. This Gyarados out speeds Jolly Smeargle and Taunts it before they can use Dark Void. This set aims to support the team with Thunder Wave and Intimidate instead of trying to sweep. Rocky Helmet punishes any Kangaskhan that attack Gyarados, especially if they try to use Fake Out on it. Choice Band Gyarados will probably catch people by surprise by hitting as hard as a Dragon Dance set without needing a turn to set up. The switch heavy nature of choice items works well with Intimidate. Mega Gyarados can now hit Levitate users with Earthquake, allowing it to OHKO Rotom-H and 2HKO Rotom-W. Mega Gyarados has some fantastic natural bulk, being equivalent to Umbreon. If you’re choosing to focus your team around Mega Gyarados be sure to provide with plenty of support. Gyarados doesn’t carry itself like Kangaskhan and Mawile do, and will need help to reach it’s full potential. Gyarados’s BFF is Manectric. Manectric redirects Electric attacks away from Gyarados with Lightning Rod, eliminating its greatest weakness. Mega Manectric also provides a second Intimidate to shut down physical attackers. Raichu can also provide Lightning Rod support as well as Fake Out and Encore support. Amoonguss, Smeargle and Pachirisu can redirect attacks with Rage Powder / Follow Me. Amoonguss and Pachirisu are the more notable users as they take little to no damage from Electric attacks. Amoonguss also threatens with Spore while Pachirisu can use Nuzzle and Super Fang to help Gyarados take out foes. If using Pachirisu you can use Ion Deluge to make Return an Electric attack giving Gyarados an Electric type move for a turn. Garchomp makes a good offensive partner for Gyarados. Garchomp is free to use Earthquake beside Gyarados. Gyarados can slow down Salamence with Thunder Wave and take out other Dragons with Ice Fang. Both make life harder for Kangaskhan which is also a positive in this format. Hydreigon appreciates Thunder Wave support to make up for its low speed, and helps Gyarados by threatening Rotom with Specs Draco Meteor. When using Mega Gyarados you’ll want some Flying types that Gyarados can use Earthquake beside. Salamence is a good partner in general. Talonflame will deal with Amoonguss and Venusaur which will give you trouble. Aerodactyl and use Sky Drop to help deal with troublesome foes. Rotom-W is a hard counter to Gyarados, which is unfortunate given the popularity of Rotom-W. Rotom-W has the choice of using Thunderbolt to OHKO Gyarados or using Will-O-Wisp to cripple it while punishing a potential switch. Rotom-H also has these options but has to worry about taking a Waterfall. Bulky Rotom-H will take an un-boosted Waterfall but it won’t enjoy it and the flinch chance makes things dicey. Mega Manectric doesn’t enjoy switching into an attack from Gyarados but it out speeds Gyarados even after a Dragon Dance and OHKOs with Thunderbolt. Grass types give Gyarados a rough time. Mega Venusaur will take anything Gyarados can dish out and heal it off with Giga Drain. Amoonguss takes most of Gyarados’ attacks, redirects them from their intended target, and punishes them with Rocky Helmet. Ferrothorn can also withstand Gyarados’ attacks and set up a Leech Seed on it. Gyarados can fill a myriad of roles on a VGC team. If you can get around the obstacles facing Gyarados it will put in a ton of work. So give the other wannabe Dragon from Gen 1 a try, you might like what you see. 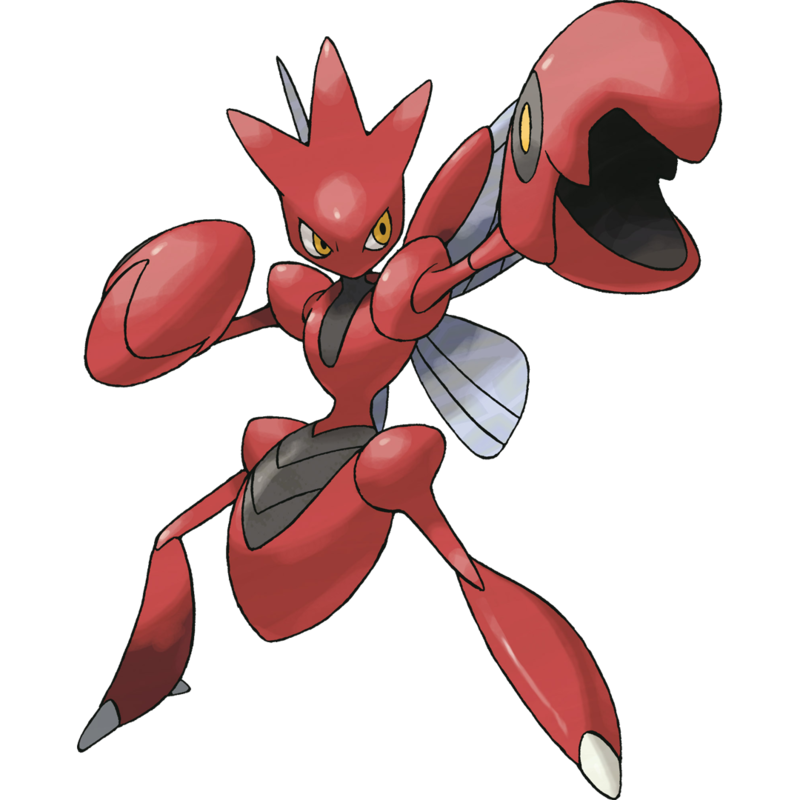 This week we’ll be looking at Scizor, a fan favourite with a long history of success in competitive play. Scizor is a Bug / Steel type, giving it a quadruple weakness to Fire and resistances to several types. In fourth Gen Scizor was the most dominate Pokemon in Smogon singles (after they banned Garchomp and Salamence) and continued to be a great Pokemon in both singles and doubles in fifth Gen.
Scizor was a popular Pokemon in VGC 2012 and 2013, but hasn’t seen as much usage as it has in the past. The reason why Scizor has seen a drop in usage is because many of the Pokemon it countered are no longer in the format, such as Cresselia and Terrakion. The lack of Cresselia has also reduced the amount of Tyranitar in the metagame, which Scizor could counter or check depending on whether or not Tyranitar carries Fire Blast. The changes to the type chart didn’t help Scizor as much as we may have hoped. Scizor makes a logical choice as a Fairy killer, however two of the most popular Fairy types, Azumarill and Mawile, are neutral to Steel. Scizor also lost it’s resistance to Ghost and Dark this generation so it doesn’t fair as well against these attacks as it used to. Scizor also lost Bug Bite as a move, which is stronger then X-Scissor and eats the opponent’s berry. Bug Bite would make Scizor’s life a lot easier against Rotom-W. The lack of Steel Gem also reduces the potential potency of Bullet Punch. Despite all of this, Scizor is still a great Pokemon for VGC. Bullet Punch threatens Gardevoir, Mega Aerodactyl and frail or weakened Pokemon in general. Bug/Steel is still fantastic typing for combating Dragon and Fairy types. Scizor has even gained a Mega Evolution, though it does little to differentiate itself from Scizor’s regular form outside of some increased stats. Scizor has a fantastic distribution of stats to work with. A sky high attack stat goes great with Bullet Punch, which makes up for Scizor’s mediocre speed stat. Scizor has decent bulk to go with its great typing. You can invest in HP and defences to have Scizor survive hits or you can invest in Speed to make Scizor faster then most Rotom-A. Mega Scizor has higher stats, but the lack of an item and the fact that it operates exactly the same as regular Scizor make it hard to justify using it as your Mega Pokemon. Life Orb and Choice Band sets hit harder, the only thing Mega Scizor has going for it is the added bulk and speed. Scizor has three Abilities: Swarm, Technician, and Light Metal. Technician gives all of Scizor’s moves with base power of 60 or lower a 1.5 times boost. This makes Bullet Punch a base 90 power priority move after STAB. Swarm and Light Metal aren’t viable in the slightest, just use Technician. Bullet Punch is pretty much mandatory on any Scizor set. U-turn and X-Scissor are our best choice of Bug STAB, and which one we use depends on the set we run. Swords Dance sets will run X-Scissor and for other sets it comes down to preference. Speaking of Swords Dance Scizor becomes an even greater threat when at +2 attack. Scizor also gets Quick Guard and Feint to help support its teammate. Quick Guard will block out Prankster, Sucker Punch, and Brave Bird. Feint will allow you to ensure damage on a slot and pick off Pokemon with low HP trying to avoid a Bullet Punch. Feint also has +2 priority so it gets around Sucker Punch and Rage Powder. Other notable options are: Brick Break, Iron Head, Roost, Acrobatics and Pursuit. This is the set Randy used in Washington Regionals and one we’ve become a fan of. A Life Orb Bullet Punch destroys Gardevoir and Mega Aerodactyl, as well as doing solid damage with priority. U-Turn allows us to deal damage to a Rotom-W and retreat for something that can absorb a Will-O-Wisp or a Thunderbolt aimed at it. Feint is just plain useful, and also gets a Technician boost. This set aims to get a Swords Dance and then threaten the opponent with a +2 Bullet Punch. I’ve invested in HP instead of Speed to ensure Scizor stays on the field for longer. I’ve put a Lum Berry on this Scizor to burn a turn from Rotom trying to use WoW. Scizor can Mega Evolve, so here’s a set for Mega Scizor. In order to justify using Mega Scizor I figure it needs a reliable form of healing to keep it on the field and Swords Dance to keep it a threat. This set is begging to have Togekiss back to redirect attacks with Follow Me, but now all we have is Smeargle, which isn’t quite the same. Amoonguss could almost fill this role is your goal is to take all the Overheats and hope the opposing Fire types are out of Special Attack by the time Amoonguss goes down. Scizor will want partners that can switch in on Fire attacks and KO the user. Rotom-Wash and Rotom-Heat are great partners, being able to switch in on any Fire attacks and threatening the users. Garchomp, Salamence and Hydreigon all have great defensive synergy with Scizor and appreciate having someone to get rid of Gardevoir for them. Garchomp and Salamence will be able to threaten Fire types with Rock Slide and Stone Edge as well. Having a competitive Pokemon like Wigglytuff would be nice be scaring away Intimidate users, and Scizor has great defensive synergy with Wigglytuff. An Acrobatics set using Lum Berry would work well with a Prankster user like Meowstic or Liepard that can give Scizor a +2 attack boost while consuming the Lum Berry to make Acrobatics as strong as possible. Fire types are the easiest way to KO Scizor. Charizard, Rotom-H, Talonflame and Pyroar can all handle Scizor with ease. Other Pokemon with Fire moves such as Mega Manectric, Salamence, Hydreigon and Scarf Tyranitar can also get the job done. Outside of Fire attacks Scizor can be dealt with using Will-O-Wisp and repeated uses of Intimidate. Scizor can still be a valuable member on a VGC team, providing your team an easy answer to Gardevoir and Aerodactyl as well as a way to finish off weakened foes.